Like last year, I have selected one post from each month in the previous year as a means of reflection. Each January brings an opportunity for my wife and I to reflect on the birth and death of our son, and on just how far we have come in learning to re-embrace hope. February was a dark month, as the economy began to take its toll. 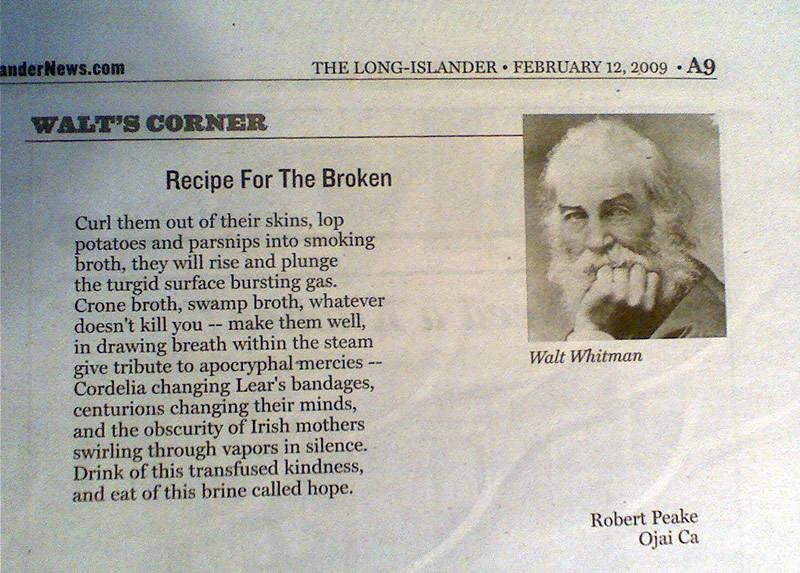 A glimmer of light came with the news that this poem had been published, on the other side of the country, beneath Walt Whitman's gaze. I discovered solace in the remarkable work of the poet Mark Doty, whose collection Fire to Fire continues to inspire and astonish me. A young marketing executive from Singapore wrote to me to ask what makes great poetry great. One of the surprises of completing my MFA was discovering an appreciation for the poems of John Ashbery. I was selected by the faculty, on the basis of my "contribution to the program" to give the student speech at my MFA commencement. It was a glorious day. I had the great pleasure of meeting Andrew Philip through the blogosphere, and interviewing him about his outstanding debut collection of poems as part of Salt Publishing's innovative Cyclone Book Tour. We marked another milestone in recovering from grief when we finally gave away the baby items originally intended for our son. The anniversary of the birth and death of a poet-friend’s son prompted this meditation on the blessings that can come from the deep self-examination profound grief can instigate. A remarkable visitor came, all too briefly, into our neighborhood, and met a tragic end. I wrote a poem about the experience, and our next-door neighbor placed an enduring metal sculpture in the tree the bear occupied right across our street. I conducted a quick, fun poll about poetry book titles, and came to some surprising conclusions about what people from different backgrounds think poetry "ought" to be. I had the pleasure of flying to Boston with Val to see two dear friends get married, and to meet their new baby daughter--the first baby I held in my arms since our son passed away. It has been an incredible year--full of poetry, hardship, and the renewal of hope. I wish you and yours peace and prosperity in the year to come. Categories: Grief Recovery, Insights, Life, and Poetry. Tags: Roundup and Year-End Review.